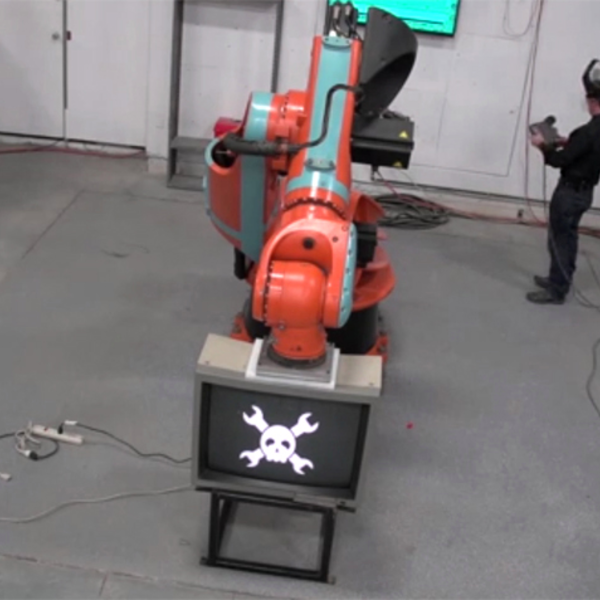 We’ve covered the [Geek Group] crushing TVs with their robot arm before although that first try was more like a fail, in the sense that the TV was only partly smashed. At the time, we joked that it was because they had a Jolly Wrencher holding the CRT together. But it could have been that the robot arm simply lacked the requisite grunt. This time they came to it with a stronger robot arm, and removed the Jolly Wrencher from the screens. These folks aren’t scientists — changing two variables at once leaves the experiment inconclusive. But they do smash things. So that’s a success, right? The Geek Group, an absurdly large and well stocked hackerspace in Grand Rapids, Michigan caught fire yesterday. You may recall The Geek Group from their many over-the-top projects that include a quarter shinker, a 200,000 Watt Tesla coil, enough capacitors to kill a demi-god, and a giant robot that crushes TVs. From what TGG has shown on their website and their YouTube, they have an amazing space that could still be the home of quite a few amazing builds. According to Geek Group head honcho [Chris], the fire was caused by an overheated electric motor. No one was at the space at the time, but the fire was hot enough to crack the exterior brick and melt porcelain insulators in their high voltage lab. To add insult to injury, this was only TGG’s second day of being open to the public. The folks at The Geek Group are looking for volunteers for their cleanup, so if you’re around the Grand Rapids area and would like to pitch in, head on over around noon today.